January « 2015 « Geekorner-Geekulture. Week 3 of the Winter season, but most shows only had two episodes. Still, we’re starting to see the season (of Durarara! !’s return!) shape up, and it’s not at all bad! 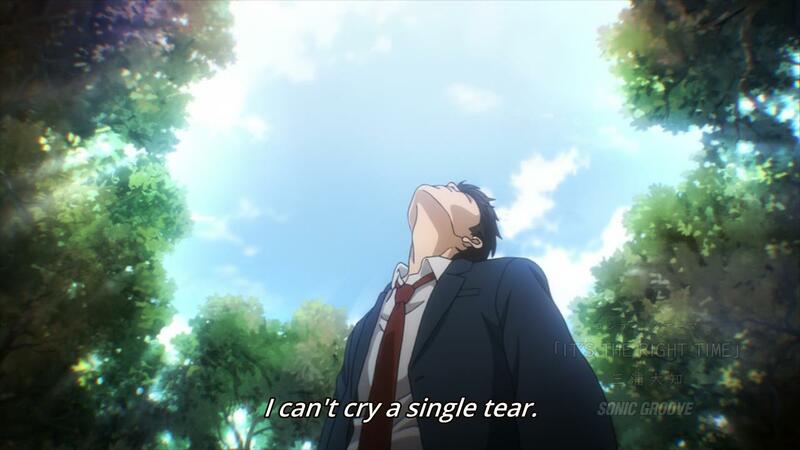 There won’t be Yuri Kuma Arashi (Lily Bear Storm) this week, because being sick, I postponed watching it. The write-ups this week are pretty long, so I’d like to hear your thoughts – would you rather have a single paragraph summary of my thoughts, perhaps with a link to the 3-4 paragraphs detailing more thematic breakdown, or do you like all the text? As always, links in title are to full write-ups (for very few shows this time around), while the shows are ordered by how much I liked the episode, compared to the others. The shows covered will be Assassination Classroom (Ansatsu Kyoushitsu), Death Parade, Durarara! !x2, JoJo’s Bizarre Adventure: Stardust Crusaders Egypt arc, Junketsu no Maria (Maria the Virgin Witch), Log Horizon S2, Saenai Heroine no Sodatekata (Saekano), Shirobako, The Rolling Girls, and Tokyo Ghoul Root A. Last week was sort of scarce on premiers, but this week had been filled with all the rest of them. So I’m going to start by listing my order on every series up to now, with a numerical score, and then I’ll list my thoughts on the episode. Longer write-ups can be had by clicking on the show’s episode title. The “Post Episode Thoughts” in particular should have my thoughts on the episode, if they weren’t copied here. As always, the list is ordered by how much I liked each episode. First impressions for Assassination Classroom (Ansatsu Kyoushitsu), Death Parade, Durarara! !x2, JoJo’s Bizarre Adventure: Stardust Crusaders Egypt arc, Junketsu no Maria (Maria the Virgin Witch), Koufuku Graffiti (Gourmet Girls Graffiti), Saenai Heroine no Sodatekata (Saekano), The Rolling Girls, and Tokyo Ghoul Root A. 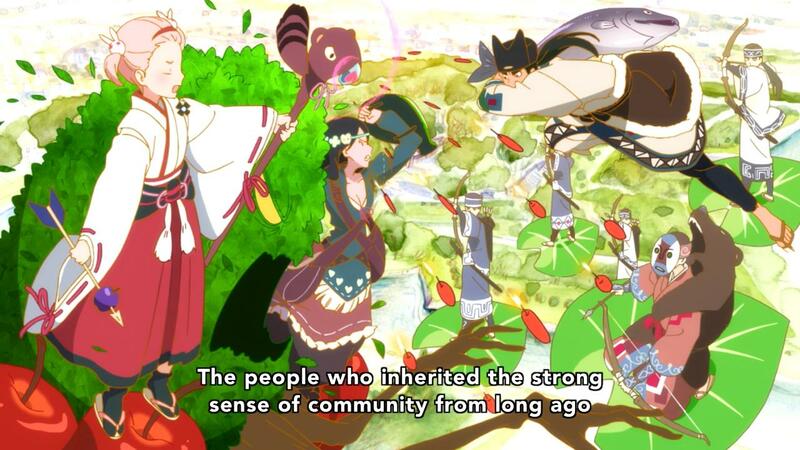 The Rolling Girls is very visually flamboyant. 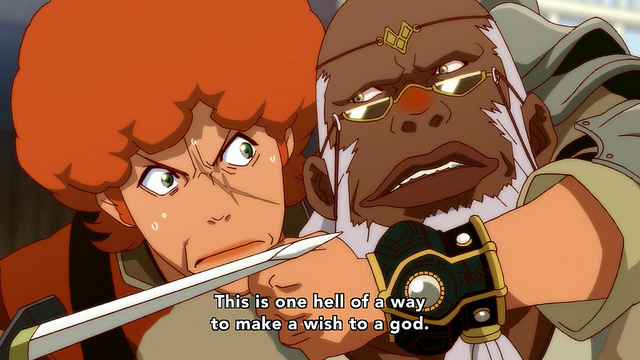 There’d also be notes on the second episodes of Log Horizon S2, Shirobako, and Yuri Kuma Arashi (Lily Bear Storm). Oh damn, I got the hour wrong. I thought this was going to be airing in 45 minutes, rather than 75 minutes ago. Well, time to get started. 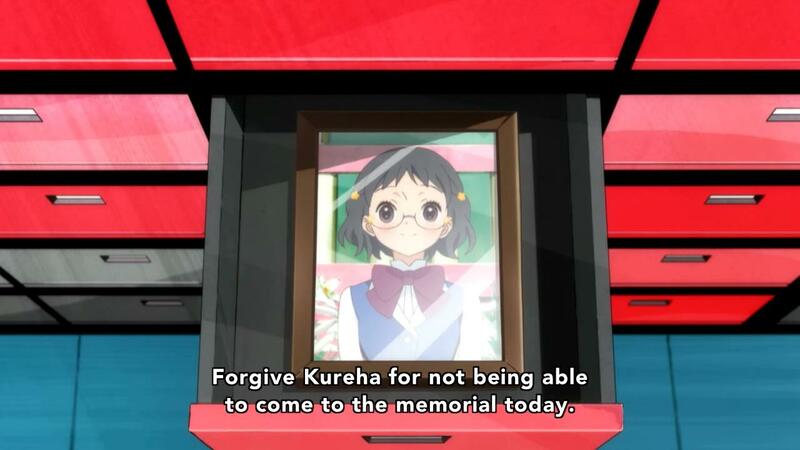 Last episode was very Ikuhara. I think the main theme, and what “The Silent Storm” is about is gossip, giving those who stand out the bad eye. 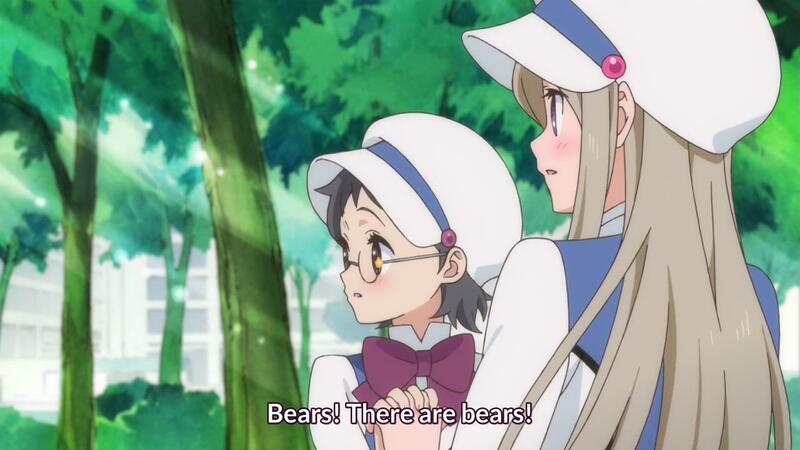 Sumika is probably gone, and it’s just Kureha and the girl-eating, girl-loving bears. Let’s see how it goes. And no, taking notes for this show isn’t wise, but I’m going to do it anyway. 1) “Bears eat people, it’s what we do!” – Again, preordained destinies, of obeying our inner natures. 2) It makes sense, you come to a “Keep Out!” sign, you don’t pay attention, and you learn things you weren’t meant to, shocking bear things. Beary shocking things. First impressions for Yuri Kuma Arashi (Lily Bear Storm) and Kantai Collection (KanColle), as well as the weekly opinion on Parasyte: the Maxim (Kiseijuu: Sei no Kakuritsu). I feel this show suffers from being talked about weekly. It’s a slow process, and multiple episodes just remind you that stuff is going on with the parasites, so there’s not always a very concrete “thing” to speak of, in terms of plot or otherwise. It does remind one of the earlier Hunter x Hunter episodes, in that sense. So, the new Ikuhara show, eh? Should be full of symbolism, and a story where one can’t tell where the symbolic ends and the real world going ons begin. I thought of Mawaru Penguindrum a while back, and thought how my brain would’ve fried had I tried taking notes for it. Well, I’m not sure if the notes will be “per scene” or “per moment of interest” here, but there will be notes. Now just to hope my brain won’t melt, as I need it. Screenshot album part 1, screenshot album part 2. Another year came to an end, I’ve sampled nearly 60 shows, watched about half to completion, and it’s time to see which shows stood out (in a good way). If we’re frank, this year hasn’t been nearly as good as 2013. Had I used the cut-off criteria of 2013, only the top 7 shows would’ve made it in, compared to 12 that passed that bar in 2013 (and Aku no Hana that passed using different criteria). But even if the year as a whole was weak, the top shows were still worthy of your time. There’d be “Notable Absentees” and “Honourable Mentions” at the end of the post, so if you don’t see a show, keep reading! One of my favourite films is the first Pirates of the Carribean film, which I describe as a 10/10 performance by Johnny Depp, lifting a 5/10 film to the realm of 7/10. The show had a great sense of action and fun going for it early on, which in the second half all but abandoned it for slow and tepid non-action weighed down by a non-character taking center stage. The first half of the show and the finale though are more than worth the price of entry. Just like Pirates of the Carribean, loveable rascals with an extreme penchant for getting in trouble and over the top facial expressions while swashbuckling dominate the show. Zombies join on our crusade to bring down a CG dragon, as we cross against angels, demons, drunk gods, and inflatable ducks. How can you not love a show so in love with its own irreverence?